"Black and Blue. Colours of love - pain that we live for. Black and Blue. I keep thinking of you. And the things that we went through". If you recognize these lyrics as a one hit wonder from Canadian band Haywire, then I guess you either know your music very well or you're were an 80's kid. For me, black and blue could also be the colour of my toe right now after a slash from the ball hockey tourney I was in 2 weeks ago. It could also referred to "Pittsburgh" rare, which is a steak that is rare in the middle while completely charred on the outside (black and blue). 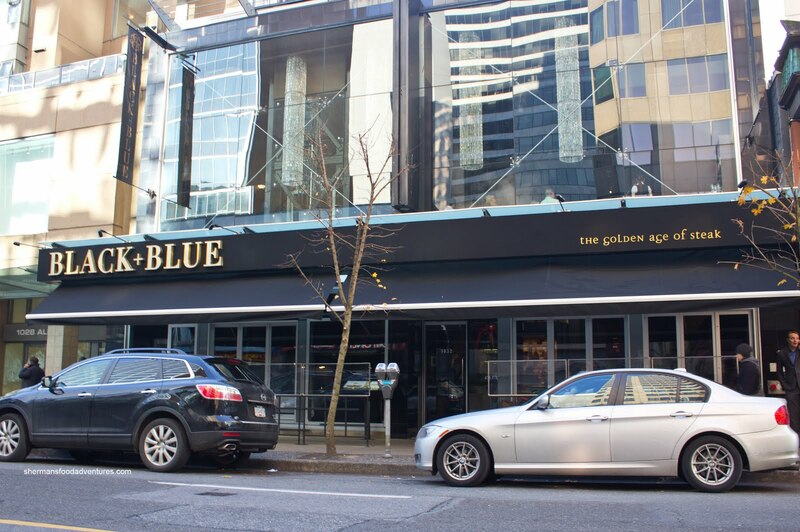 This is the premise behind the Glowbal Group's latest venture in Vancouver. Located in the former Town Hall and literally steps away from Coast and Italian Kitchen, it almost seems like a sinister plan to take over the 1000 block of Alberni. Viv and I were chomping at the bit to visit the place (since we had some Glowbal gift cards kicking around), but we had to wait a month after it opened (to celebrate her birthday). As we entered through the large glass doors, it was quite apparent that they spent top dollar on the decor. But then again, this is not uncommon for the Glowbal Group as they do want to project an image. And proudly displayed on the back wall, in all its glory, was a display case with all their cuts of meat. Naturally, our intentions were to try their specialty. After all, it is a steakhouse... However, we got a couple of appies which were of the non-red meat variety. As recommended by our server, Viv had the Prawns Saute prepared with Remy VSOP brandy, lemon, tarragon and chive butter. The prawns were absolutely massive and cooked perfectly. 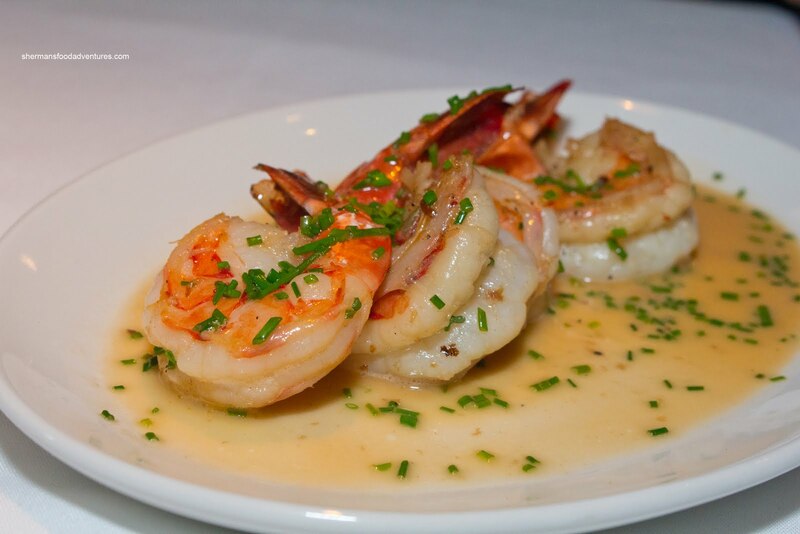 With a crunch and a snap, these naturally sweet prawns were devoured quickly. As much as we enjoyed the smooth subtle sauce, the dish would've benefited from just a touch more acidity to liven up the flavours. 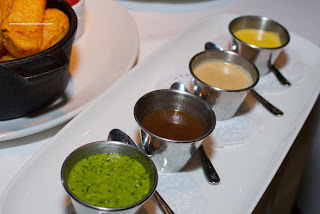 For myself, I was eying the Crab Cake Fondue. It was essentially a large crab cake topped with crunchy bread crumbs resting on a lobster cream reduction accompanied by toast points. 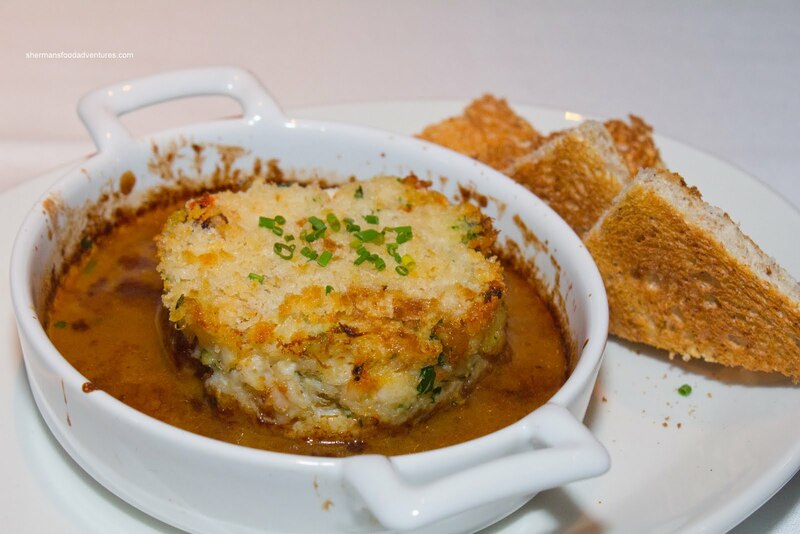 Normally, crab cakes are a mix of crab and a filler such as mayonnaise and bread crumbs. Well, this was not really the case here. In fact, all I could see was fluffy crab meat. The lobster cream was very flavourful and rich, much like a lobster bisque. Viv thought the cream was too salty, but for myself, I liked this appetizer a lot. Now for the meat... Viv opted for the 10oz Prime Rib served with mashed potatoes, asparagus, golden beet, Yorkshire pudding, red wine jus and horseradish. 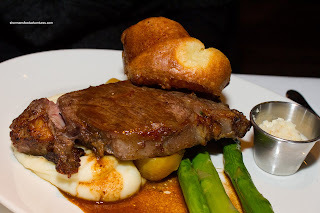 Although I was a bit surprised with the seared prime rib (I'm more used to the "cut from the roast" version), it was a perfect medium-rare as Viv requested. The meat was moist and tender which required very little effort to chew. Mashed potatoes were airy and buttery, while the asparagus was still crunchy while cooked all the way through. Viv loved the flavourful red wine jus which exhibited plenty of depth while I liked the ho rseradish that packed quite a punch. 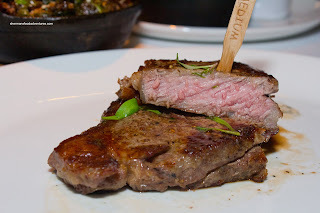 As for myself, I had the PEI Blue Ribbon 12oz New York Strip. By referencing the picture, it is pretty obvious the steak was cooked slightly beyond medium-rare (as I requested). Despite this, the meat was cooked uniformly on both sides and was still tender. 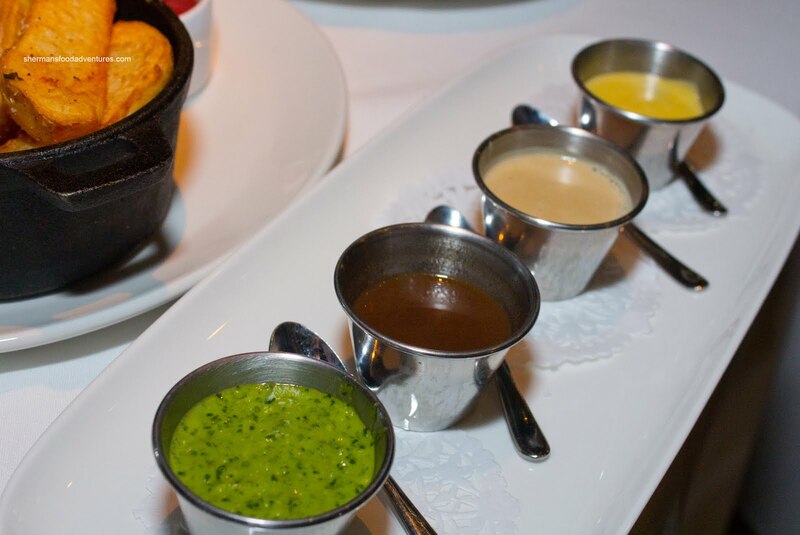 Served on the side was 4 different sauces consisting of Chimichurri, Cabernet Jus, Peppercorn and Bearnaise. The best of the bunch was the chimichurri hands down. This particular version was pretty thick where the oil was not even visible (looked pretty emulsified or they used mayo). For me, that was a plus since each piece of meat I dunked in the sauce came out completely covered. It was pretty mild yet did add some brightness which did not overwhelm the meat. The cabernet jus and bearnaise were pretty good while the peppercorn was too thin and lacking in punch. For my sides, I went for Brussel Sprouts and Steak Fries. 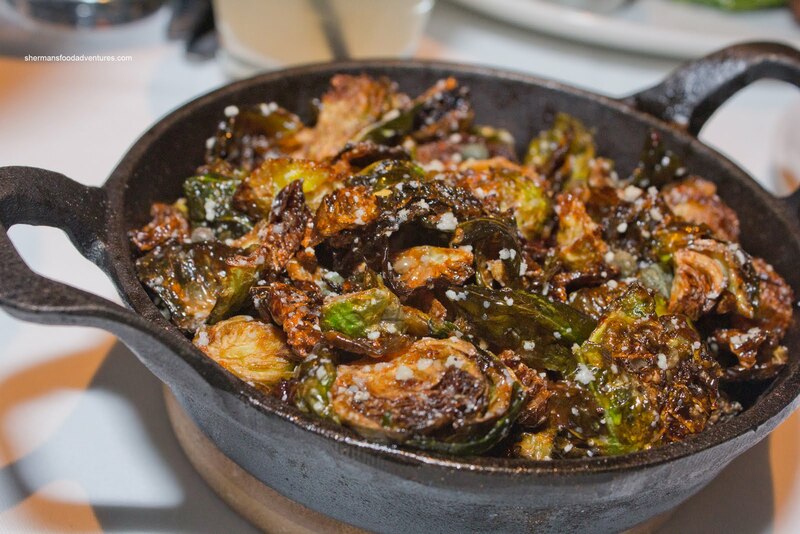 You may recognize the brussel sprouts from Sanafir. 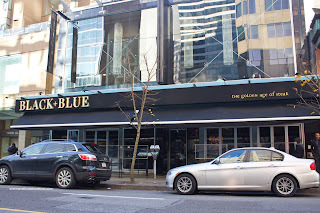 Despite my love for this dish, I'm not sure if it is a good strategy for Glowbal to include items from their other restaurants considering that Black & Blue competes with the likes of Gotham (it loses exclusivity). Anyways, fried and the tossed with lemon, capers and Parmesan, these would make most people forget what they are. I'm not a huge fan of brussel sprouts, but I do like these. Viv thought that they were even better than the one we had at Sanifir because there was more acidity and flavour. 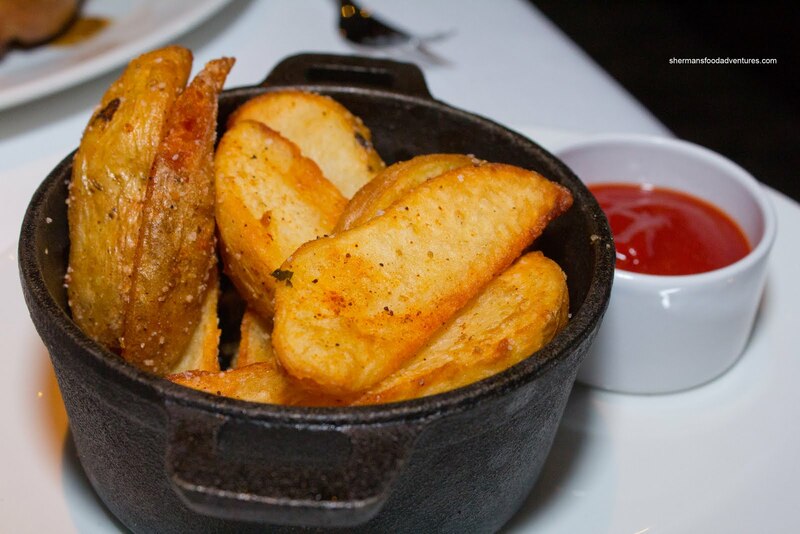 When the steak fries arrived, they reminded us of Red Robin. Before you laugh, that was not an insult. We like the fries at Red Robin! On the other hand, these were more crispy and uniformly fried with lots of potatoey goodness inside. By now, we were pretty stuffed. Yet, we couldn't leave without trying at least one dessert. 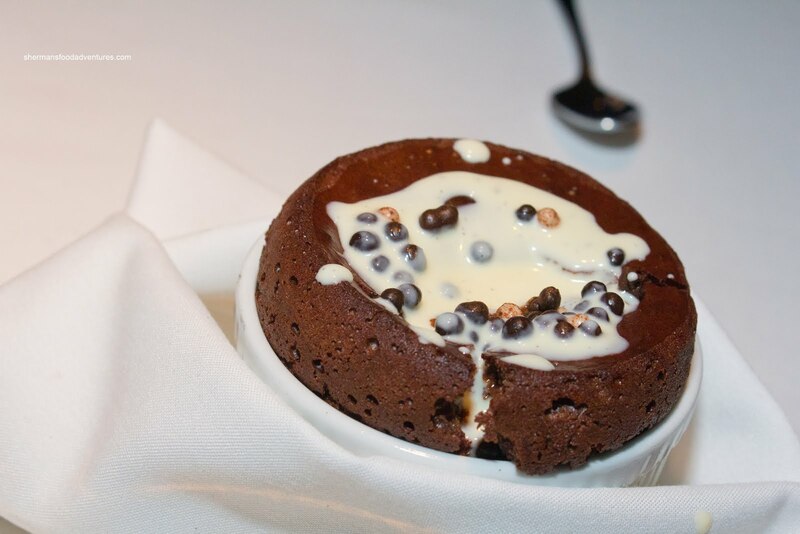 The most interesting from the menu was the Chocolate Souffle with vanilla sauce. Although not visible in the picture, the depth of the ramekin was substantial. Therefore, this was not a small souffle and it was quite impressive that it did not collapse. Inside, it was fluffy, chocolatey and only semi-sweet (even with the sauce). We really liked the crunchy bits on top which added great texture. @WG No, the prime rib and other entrees are not. Just the steaks. Went last night and it was a total disappointment. 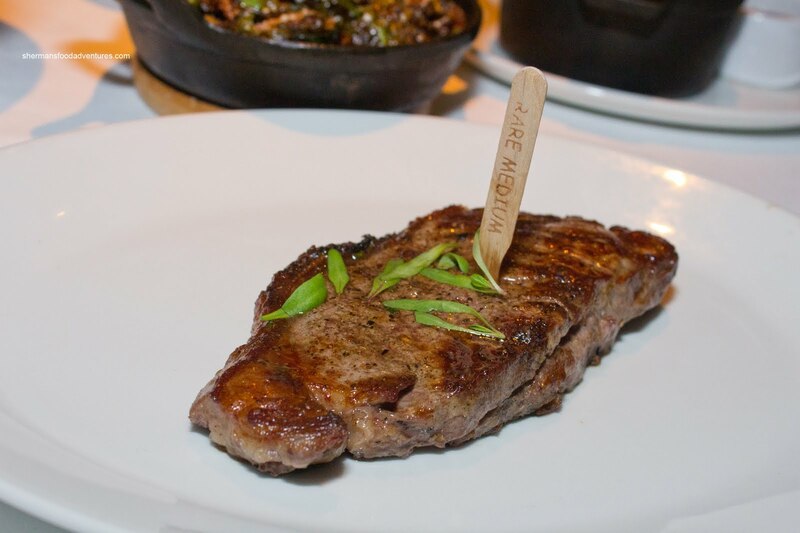 A steak house should be able to prepare meat they way you request....or they shouldn't ask. 3 prime rib ordered , Rare, medium and med,well. So not worth it for the money they charge. @AWINTTK Yah, I've heard that too. Inconsistent... But for all the expensive steakhouses I've been to, I've never had everything come out perfect. Especially the porterhouse. This includes Tom Coliccio's Craftsteak in LV. Mind you, the porterhouse is 2 steaks in one which makes it hard to cook evenly. My point is, it is very difficult to nail everything (where there are so many variables), so I am a little bit lenient that way. On the other hand, if it costs so much, then I can also understand why people would not be happy. I grew up with people around me running restaurants, it's not as easy as it looks.